Now, I went to this movie because I am not a big fan of JACK REACHER, and it's sequel already got trashed by critics badly. I wanted to watch something which is a film without some sensible script and just action, because last week I saw two similar films and they turned out to be bad. 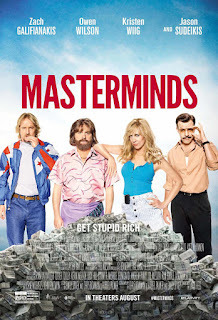 I saw MASTERMINDS, even tough it didn't looked like a GREAT film, but I knew I would have a great time, so lets start the review! Now I wasn't expecting much from the film, just wanted a nice entertaining film, Did I got it? 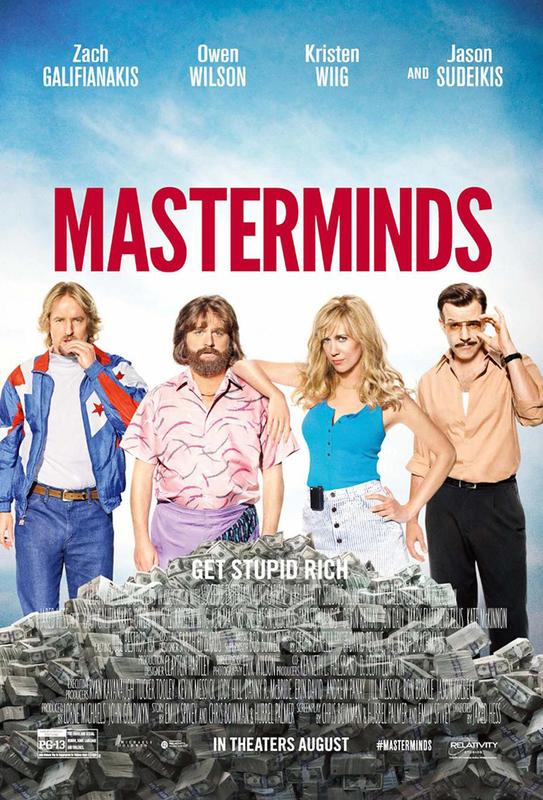 In a way yes, this movie is entertaining, but it is like most of the comedies these days, nothing so special about it. I had lots of laughs in the film, but some things just didn't made sense. But it is like a dumb comedy, something like one of the best comedies ever made, DUMB & DUMBER etc. This movie has three main genre's in it, CRIME, COMEDY & ACTION. It reminded me of COEN BROTHER's RISING ARIZONA, which was a good film, and this one has surely taken some inspiration from it. Starting of with the performances, now I love ZACH GALIFISANAKIS, this guy always make me laugh, and he didn't disappoint with this one, he gives a brilliant performance, I have loved him in THE HANGOVER, DUE DATE & Ofcourse the masterpiece BiRDMAN. He is great and does justice to his roles. He was the limelight in the film. Other actor's like KRISTEN WIIG, OWEN WILSON, were not GREAT, but yeah like a normal decant role. The structure of the film is loose sometimes, it's pacing gets a little slow at times, it is based on a true story, which made it more interesting tough. Even tough I had a good time with the movie, but I cannot say it is a GREAT film, it has flaws here and there, but again I have said these things before, these films are footnote movies, "Guilty Pleasures". They are not particularly important, all they give is a real nice time. It did'nt wanted to be a contender in the BEST PICTURE for OSCARS, nor it want's a GREAT critical response, this film just wants you to have a nice time, and enjoy that's it. As soon as got out of theatre I had forgotten the film, I remembered some scene's, and especially the one's I laughed that's it. In the end, I surely enjoyed the film, I wouldn't like to watch again anytime soon tough, it is a one time watch, and as there aren't any GREAT films this weekend, you can give this a go, and have a nice time with it. If, I look through a critic's eyes, okay this film wasn't GREAT, but as a normal audience, it was a GOOD, high-end comedy, That's it! LET ME KNOW THE FEEDBACK IN THE COMMENT SECTION! Vastik, you need to start proofreading your content. It's good stuff, but too many errors. Thanks for the feedback, would work on it mate :).